Spencer Conway’s 'Circumnavigation of Africa by Motorbike'- reported in the press worldwide - is nothing short of remarkable. Having set off from Biddenden in Kent, on November lst 2009, by the middle of March he had been through thirty borders and travelled 27,000 kms. During this time he has camped in the middle of the Libyan desert with Nomads, been attacked by a gang in Sohag, Egypt, stopped by the police in Ethiopia for driving over a used condom (!!! ), shot off his bike by Boran Shiftas in Northern Kenya when he was lucky to escape with his life and finally hitting a wandering goat at over 100kms per hour in Mozambique, which proved a very messy affair! Spencer has faced the challenge of negotiating four deserts entirely alone, feeling at the time that he was the only man on earth, where he experienced, to mention but two incidents, a violent sandstorm in the Sahara and a flash flood in Namaqualand, Namibia. 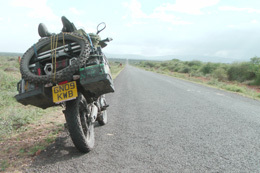 Numerous punctures and ripped tyres on the rough stone roads in remote areas hindered his progress in The Sudan and Malawi, not to mention coming off his Yamaha XT 660 Z Tenere on three occasions, injuring his back and ribs. This was followed by a throat infection and a swollen foot caused by a spider that was trapped in his sleeping bag. The road now ahead will take him through another fifteen countries, which include the daunting territories of Angola, DRC and Nigeria and the less than roadworthy tracks of West Africa. It should be noted that he is undertaking this expedition solo and unsupported, without GPS and covering double the distance of 'A Long Way Down', this would deter most but the hardiest of adventure bike riders. Having to negotiate little used tracks and dangerous areas on the next stage of the 'journey', he is also filming with his HD movie camera in an endeavour to chronicle as much as possible. He is at the same time hoping to raise as much money as possible for 'Save the Children'. Spencer has camped many a night alone under the stars often in amazing locations, once in close proximity to the spectacular Meroe pyramids of Sudan and on another occasion in the shadow of the awe inspiring Mt Kilimanjaro in Tanzania. He has met many colourful characters on his way. A Canadian who is walking around Africa, when he's not hitching on a donkey. A one legged biker and a one legged boat owner in Aswan, Egypt. Take all these elements together and Spencer's expedition is turning out to be one of the most dramatic stories of the year.